HARARE, 2 September 2014 (IRIN) - Girazi Mukumba, 64, a communal farmer in Wedza, about 160km southwest of the capital Harare, is old school when it comes to agricultural practices. On his three-hectare plot he uses cow dung manure on his maize, local herbs to treat his cattle, and believes the benefits of chemical fertilizers are a “white man’s myth”. Repeated crop failures during successive dry spells and drought have ravaged his production and he wants to branch out, like his neighbours, into poultry or piggery to help sustain the four grandchildren he cares for - but he is deemed too old by community-based organizations to merit assistance. Mukumba does not understand why he is routinely bypassed by officers from the Agriculture Ministry’s extension services and NGOs who sporadically visit his village to offer advice on farming techniques. “Even these young men and women who have been told why there are so many droughts these days have no time to explain these things to old people like me. They say I am too old and therefore cannot understand a thing,” Mukumba told IRIN. Mukumba and his 56-year-old wife care for their late daughter’s three children and a grandchild from their son, who works as an agricultural labourer in neighbouring Botswana and occasionally remits small amounts of money. Agricultural and food production experts say elderly people still contribute significantly to household food security through farming, but are limited by their exclusion from mainstream support programmes, such as those promoting climate change adaption techniques. “Elderly persons make a great contribution to household food production in rural areas. They face the heavy burden of looking after families, as younger persons leave home to look for jobs elsewhere, yet they meet numerous hurdles that affect their farming activities,” David Phiri, the UN Food and Agriculture Organization (FAO) sub-regional coordinator for southern Africa and Zimbabwe, told IRIN. Phiri said, according to UN guidelines, elderly people were defined as aged 60 and above in a country where, according to the World Health Organization (WHO), life expectancy is 60 for women and 56 for men. “They [the elderly] generally lack the energy to travel distances to benefit from agricultural extension services and, generally, cannot finance veterinary interventions for their livestock and are excluded from the mainstream market linkages. They are socially isolated from their communities because of age,” he said. Wonder Chabikwa, the Zimbabwe Commercial Farmers Union (ZCFU) president, told IRIN that while some of the elderly were included in agricultural support services by government and NGOs, most were shunned. “The irony about smallholder farming in Zimbabwe is that government and other stakeholders generally do not acknowledge the contributions that the elderly make to food production for families and the nation,” he said. “In our own estimates, older persons who are actively involved in farming on communal and resettled farms could be around 15 percent of the rural population doing subsistence and micro-commercial agriculture. That is too big a figure to be ignored but, unfortunately, that is what is happening,” said Chabikwa. He said while elderly people are classed as 60 and above, those between 50 and 59 tended to be placed in the same category, as they were excluded from the 15-49 age bracket that stakeholders tended to concentrate on. The 2012 population census found Zimbabwe has about 13 million people and nearly 70 percent of the population reside in rural areas. According to the UN Population Fund (UNFPA), Zimbabwe has about 758,000 older persons, which is six percent of the population. The Zimbabwe National Statistics Agency (ZIMSTAT) says agriculture is the main source of livelihood for about half the population. “As a union, we have discovered that younger smallholders are preferred because they are seen as having the energy and are easy to communicate with. It is as if the aged don’t exist, yet many households out there are under their care and guidance. They are [a] critical but constrained farming group that deserves recognition,” said Chabikwa. Older farmers, like younger ones, need training on soil management best practices, how to adapt to climate change, how best to market their products and diversify into other forms of farming such as poultry and piggery, he added. He said households headed by elderly farmers were generally more vulnerable to food shortages - unless they were supported by other family members employed in the cities or were in receipt of adequate diaspora remittances. 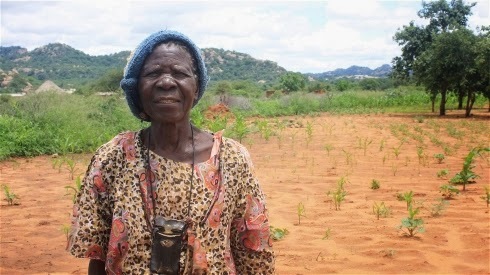 Most elderly people were also not beneficiaries of the 2000 fast-track land redistribution programme, which saw about 4,500 white-owned farms redistributed to about 300,000 black small-scale farmers, Innocent Makwiramiti, a Harare-based independent economist, told IRIN. “This means that most of them [elderly farmers] remain farming on tired soils in largely dry areas that require much fertilizer and water, and a great deal of farming support,” Makwiramiti told IRIN. FAO’s Phiri said elderly families were further hampered by poor access to health services because of poverty, a situation that reduced their productivity and, in turn, made their dependants food insecure and lowered their nutritional standards. A June 2014 study by FAO and HelpAge International (HAI) on agricultural production and HIV/AIDS noted that 66.4 percent of elderly farmers experienced cereal deficits every year and “were faced with health problems which slowed down participation in agriculture while their contribution to society, especially in agricultural productivity… has not received adequate attention”. The report, Livelihoods of Older Farmers and Households Affected by HIV and AIDS, has not yet been published online. It said 76.8 percent of the elderly smallholder farmers surveyed suffered from various forms of chronic ailments, including hypertension, backache, eye problems, diabetes and HIV/AIDS. “There is an overwhelming body of knowledge which attests to an increasing higher burden of care by older people of both OVC [orphans and vulnerable children] and PLWHA [people living with HIV/AIDS],” said the FAO/HAI report, which noted that 65.1 percent of households in surveyed areas cared for orphans. Meanwhile, Gift Muti, head of the General Agricultural and Plantation Workers’ Union of Zimbabwe (GAPWUZ), told IRIN failure to support the elderly farmers was reducing their families’ capacity to cope with social shocks, resulting in a high incidence of children in their care dropping out of school due to poor nutrition and an inability to pay tuition fees.